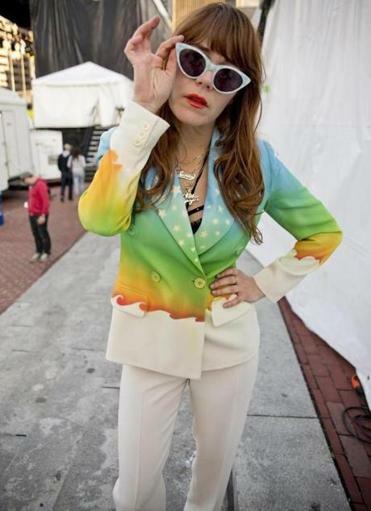 Jenny Lewis took the stage at the Boston Calling music festival Saturday in a white, double-breasted suit airbrushed with a rainbow cosmos. The getup that Lewis calls “graffiti Gram Parsons” will make the cover of her third solo album, “The Voyager,” due July 29. 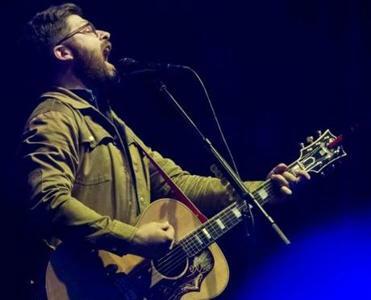 Over the past decade, Lewis’s effortless style and revealing lyrics have generated a devoted fan base — and crushes from girls and boys alike. In Rodarte leather ankle boots trimmed with silver snakeskin, the former lead singer of Rilo Kiley sat down before the show to talk about her reputation as a tomboy, and her first solo album in six years. Q. How did you come up with the idea for the cover outfit? A. In the past, like for the last Rilo Kiley record, “Under the Blacklight,” I wore exclusively hot pants because the themes in that record were the underbelly of Los Angeles. This record has a different tone and in some ways there is a femininity to it but there is also a masculine side. The suit was something I wanted to try out on this run. Q. Designer Adam Siegel airbrushed the suit, how did you start working with him? A. I collaborate on every record with Autumn de Wilde. She is an incredible photographer. When I make a record I rely on Autumn to create a mini movie subtext in all of the album art. She’s got an amazing crew, [including Siegel] and Shirley Kurata, style genius. Her personal style is my favorite. They also work a lot with Rodarte. Autumn has been documenting Rodarte since the very beginning. What began as a potential gamble last year has become a vibrant new tradition for this city’s cultural landscape. Q. How does the suit style translate into the album art? A. The record is called “The Voyager” but it’s not a sci-fi record. I wanted to capture that cosmic feeling through a ’90s filter. Q. What was the idea behind the jewelry on the cover? A. I wanted to try out the album title in gold before I put it on the cover of my vinyl. Then my best friend gave me an hourglass necklace. The hourglass appears in the album lyrically but also in the album art. There are some “Where’s Waldo” hourglasses in the album art. Q. How has your style evolved from the release of Rilo Kiley’s first album, “Take Offs and Landings” in 2001, to now being a solo artist? A. I am a tomboy so early Kiley I wore jeans, T-shirt, a weird half-ponytail with too short bangs and no makeup. Slowly I started feeling more confident to dress up on stage. In the beginning I really couldn’t because we were four people in a van. My suitcase had to be small and I had to change in public ladies bathrooms — we didn’t have backstages at that point. Then I did the Postal Service tour and that was the first time I conceptualized an outfit. That was dirty whites because I knew we would also be in a van. I wore the same white jacket and white pants for the entire tour and never washed them. Sounds gross. By the end of the tour they were truly dirty whites. From there what I was wearing became an extension of the music. Q. Have you made any fashion faux pas? A. I wouldn’t call it a faux pas but I have about 12 tracksuits. I always travel in a tracksuit. I feel it makes people happy when they see me. You can’t really be serious if you are looking at a 5-[foot]-3 redhead in a red tracksuit and shell toes. Q. When did you start wearing them? A. I started doing that in the ’90s. I am a huge hip-hop fan and growing up I only listened to hip-hop so I dressed accordingly. I readopted my fashion from when I was 15 years old. Although in the ’90s the tracksuits were oversize. Now they are extra small. Q. Are you wearing an Adidas tracksuit? A. Hell yeah, I am! There is no other tracksuit. Q. You are a thrift store fan. A. I am in a constant cycle of selling my clothes at Wasteland and buying from Goodwill. Once or twice a year I go through my closet and donate everything to Goodwill. It feels like I am recycling my fashion. Q. Do you have a go-to store in Los Angeles? A. I would never tell. The whole idea behind thrifting is it is a secret. You can’t give away your secret. Interview was condensed and edited. Alexa McMahon can be reached at alexa.mcmahon@globe.com.